Avigliano Umbro is just few km away from Amelia. The income to the town is through Porta Vecchia, one of the most remakable artistic examples of the town, still with the symbol of the big eagle holding two smaller eagles, image of Todi commun, whichh for a long time had control over the town. 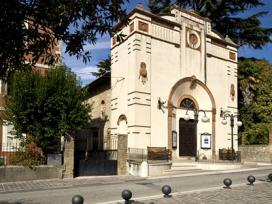 The church of Sant'Egidio, of romanic style, is the oldest example of religious architercure of the village. The parish church preserves nice frescoes of the baroque style to be attributed to Bartolomeo Barbini from Montepulciano. Remarkable nearby the village of Silano, the Middle Age Castle.The communal theatre is the place where people from Avigliano are most like to meet. On the same square the tower, with the typical windows, is worthwile a visit. Nearby Avigliano Umbro, the village of Dunarobba, whose castle can be visited, and mainly the fossil forest, are of great artistical and scientific interest respectively. Other center of interest not far from Avigliano Umbro is Toscolano, whose church of SS. Annunziata preserves frescoes of Pier Matteo from Amelia. The church of Sant'Andrea, has inside paintings of Andrea Polinori and Palminius Alii.